Three decades following the onset of efforts to revert widespread eutrophication of coastal ecosystems, evidence of improvement of ecosystem status is growing. However, cumulative pressures have developed in parallel to eutrophication, including those associated with climate change, such as warming, deoxygenation, ocean acidification and increased runoff. These additional pressures risk countering efforts to mitigate eutrophication and arrest coastal ecosystems in a state of eutrophication despite the efforts and significant resources already invested to revert coastal eutrophication. Here we argue that the time has arrived for a broader, more comprehensive approach to intervening to control eutrophication. Options for interventions include multiple levers controlling major pathways of nutrient budgets of coastal ecosystems, i.e., nutrient inputs, which is the intervention most commonly deployed, nutrient export, sequestration in sediments, and emissions of nitrogen to the atmosphere as N2 gas (denitrification). The levers involve local-scale hydrological engineering to increase flushing and nutrient export from (semi)enclosed coastal systems, ecological engineering such as sustainable aquaculture of seaweeds and mussels to enhance nutrient export and restoration of benthic habitats to increase sequestration in sediments as well as denitrification, and geo-engineering approaches including, with much precaution, aluminum injections in sediments. These proposed supplementary management levers to reduce eutrophication involve ecosystem-scale intervention and should be complemented with policy actions to protect benthic ecosystem components. The rise of coastal eutrophication as a global problem, first addressed in the 1970’s (Ryther and Dunstan, 1971; Nixon, 1995), led to effort to reduce nutrient inputs into the ecosystems, spreading from pioneering efforts in northern Europe and North America to the world. Three decades after these efforts were initiated, nutrient inputs have been reduced by 25% (e.g., Nitrogen inputs to Chesapeake Bay, Lefcheck et al., 2018) to 50% (e.g., Danish coastal water, Riemann et al., 2016), and in a few cases reverted back to nutrient inputs comparable to those before the onset of eutrophication (e.g., Tampa Bay, Sherwood et al., 2017). However, the expectation that phytoplankton primary production in coastal ecosystems is proportional to nutrient inputs (Nixon, 1995) and, therefore, should be reversible upon reducing nutrient inputs, through a parallel “oligotrophication” process (Nixon, 2009), has failed to be confirmed (e.g., Duarte et al., 2009; Carstensen et al., 2011). Evidence that eutrophication and oligotrophication are not simple complementary processes driven by a single lever, nutrient inputs, revealed a number of complexities in the responses of coastal ecosystems to eutrophication (Cloern, 2001). These include the operation of feed-back mechanisms, such as internal phosphorus loading through vertically segregated primary production in upper layers and remineralization in anoxic bottom layers, and shifting baselines due to concurrent changes and cumulative human pressures acting upon coastal ecosystems (Cloern, 2001; Duarte et al., 2009; Carstensen et al., 2011). Forcing of biogeochemical processes in coastal ecosystems is now driven by both disruptions in the watershed, such as increased nutrient inputs from agricultural practices, and global processes linked to elevated anthropogenic emissions of CO2 to the atmosphere, leading to warming, ocean acidification, deoxygenation, changes in precipitation and accelerated sea level rise (Doney, 2010). Warming affects the oxygen budget of coastal ecosystems through increased stratification and elevated respiratory demands (Steckbauer et al., 2011), and compounds with global trends toward ocean de-oxygenation to increase the likelihood of coastal hypoxia (Breitburg et al., 2018). Likewise, vertically segregated primary production in upper layers and remineralization in bottom layers of stratified eutrophic coastal waters lead to elevated CO2 in the bottom layer, which compounds with the trend toward elevated CO2 resulting from ocean uptake of anthropogenic CO2 released to the atmosphere (Borges and Gypens, 2010; Cai et al., 2011; Wallace et al., 2014). These combined trends render eutrophic coastal ecosystems more vulnerable to acidification. Warming of coastal waters is expected to favor the occurrence of harmful algal blooms (Gobler et al., 2017). Such blooms, including green tide blooms of Ulva sp., may also be favored by elevated CO2 (Gao et al., 2017). Warming also enhances eutrophication-impacts on ecosystem components such as seagrasses, with recent mass-mortality of seagrass with heat waves reported in a seagrass meadows in the Mediterranean Sea (Marba and Duarte, 2010), Florida Bay (United States, Carlson et al., 2018), and Shark Bay (Australia, Arias-Ortiz et al., 2018), and may, therefore, counter the recovery trend expected from nutrient reduction efforts. Lastly, increased precipitation with climate change is projected to enhance eutrophication in some coastal waters because it increases nutrient delivery to and stratification of coastal waters (Sinha et al., 2017). Early evidence for the effectiveness of reducing nutrient inputs was derived from the observation that the dramatic reduction in fertilizer use in areas impacted economically by the collapse of the Soviet Union led to improvement in water quality, including that of the Black Sea (McQuatters-Gollop et al., 2008; Oguz and Velikova, 2010) and Cuban coastal waters, where fertilizer applications declined fivefold at this time (Baisre, 2006). Following three decades of sustained efforts to reduce nutrient inputs, coastal ecosystems around the world now start to show encouraging evidence of recovery (McCrackin et al., 2017), as recent evidence for Tampa Bay (Sherwood et al., 2017), Danish coastal waters (Riemann et al., 2016), Chesapeake Bay (Lefcheck et al., 2018), the Wadden Sea (van Beusekom, 2010; Dolch et al., 2013), and areas within the Baltic Sea (Andersen et al., 2017), among others, demonstrate. However, increasing pressures from climate change threaten to shift baselines and arrest coastal ecosystems in a eutrophic state despite reduced nutrient inputs, thereby jeopardizing some of the expected benefit from nutrient load reductions. For instance, Boesch (2018) indicated that for the Chesapeake Bay it could require an additional expenditure of US$ 1 billion over 5 years to offset the model-estimated effects of climatic changes on the severity of hypoxia, even if existing nutrient-load reduction targets were reached by 2025. There is, therefore, a pressing need to accelerate efforts to recover coastal ecosystems from eutrophication. Here, we argue that diversifying the strategy to consider additional intervention options is needed to accelerate efforts to recover coastal ecosystems from eutrophication, and provide an overview of the intervention options to revert coastal eutrophication and their effectiveness in catalyzing the oligotrophication process. We address interventions at the catchment level and focus, particularly, on interventions in the coastal marine ecosystem. Conventional interventions to mitigate against coastal eutrophication focus on efforts to reduce nutrient inputs by improving waste-water facilities and regulate agricultural practices, such as fertilizer application and manure management schemes (Nixon, 1995; Boesch, 2002). These actions have played a fundamental contribution to mitigate eutrophication and drive coastal ecosystems toward recovery, and must be maintained and enhanced. Further interventions on land include creating freshwater wetlands to enhance nutrient and organic matter removal (Vymazal, 2007) and using winter catch-crops to further remove nutrients from nutrient over-enriched soils (Andersen et al., 2014). However, nutrient inputs from the watershed is only one of four main processes affecting nutrient mass balances in coastal ecosystems, i.e., nutrient inputs, nutrient export, nutrient burial, and nutrient emission (Figure 1), all of which should be considered in intervention options. Figure 1. Schematic representation of nutrient fluxes in coastal sediments, including, along with each main pathway, the main intervention options available. Nutrients entering coastal ecosystems may be exported with hydrological flows, in either dissolved or particulate form, buried in sediments, or, in the case of nitrogen, emitted to the atmosphere (Figure 1). The resulting nutrient concentrations are governed by the balance between these processes. Hence, inputs are modulated by exports, governed by hydrological exchanges and the residence time of the coastal ecosystem, and burial in sediments, as formulated half a century ago by Vollenweider (1970). Each of the four main processes is amenable of intervention, thereby providing a broader slate of levers to complement efforts to reduce nutrient inputs on land to revert eutrophication. In addition, efficient nutrient cycling, a component of ecosystem homeostasis, depends on the integrity of food webs in coastal ecosystems (e.g., Cloern, 2001; Pérez-Ruzafa et al., 2011). Therefore, interventions at the ecosystem scale should ensure that the heterogeneity supporting efficient nutrient cycling is not disrupted. There are two main avenues for interventions to enhance nutrient export, one involving hydrological engineering of the coastal system to reduce residence time and increase flushing and dilution with coastal waters, and the other by harvesting ecosystem components able to remove nutrients from the water column, such as seaweed and filter-feeders (Figure 1). Hydrological engineering of ecosystems (also termed ecoengineering with ecohydrology), the manipulation of flows to enhance ecosystem status in coastal ecosystems, has a relatively long tradition (Elliott et al., 2016), and its effectiveness has been demonstrated in dozens of cases across the world, including ecosystems in Europe, North America, Oceania and others. This intervention is only possible, however, for semi-enclosed estuaries and lagoons and, particularly, intermittently closed and open lakes and lagoons (Schallenberg et al., 2010), where the flushing can be regulated by changing sluice practices or broadening the channels connecting the lagoon to the open coastal waters. For instance, such practices have been applied to increase the flushing of Chilika lagoon (India, Ghosh et al., 2006), Lake Veere (Netherlands, Wijnhoven et al., 2010), Waituna Lagoon (New Zealand, Schallenberg et al., 2010), Ringkøbing Fjord (Denmark, Petersen et al., 2008), and the Peel-Harvey estuary (Australia, Humphries and Robinson, 1995), in all cases leading to improved water quality (Table 1). Table 1. Examples of reported cases of hydrological engineering (ecoengineering with ecohydraulics) to mitigate eutrophication in coastal lagoons and estuaries. In addition to enhancing nutrient export and dilution, hydrological engineering of coastal lagoons and semi-enclosed estuaries to increase the influx of coastal waters has often been reported to facilitate the development of populations of benthic marine organisms, such as bivalves, seagrasses, mangroves and salt-marshes, which further contribute to removing nutrients through burial and nitrogen emissions to the atmosphere (see below). For instance, changes in sluice practices to increase coastal water input into Ringkøbing Fjord not only enhanced dilution, but allowed the establishment of a population of the filter feeding bivalve Mya arenaria, which contributed to remove plankton and improve water quality, thereby catalyzing a regime shift (Petersen et al., 2008). However, ecohydrological interventions need be considered with care, using models to predict possible responses, to avoid negative experiences due to ill planned interventions (Schallenberg et al., 2010), such as those when the coastal waters flushing the lagoon are also eutrophied and, therefore, little or no dilution is achieved. Ecological engineering may further contribute to nutrient export (Figure 1). In particular, seaweed aquaculture is a very effective tool to remove nutrients (Xiao et al., 2017). An assessment of the role of seaweed aquaculture in nutrient removal from highly eutrophied Chinese coastal waters showed that 1 ha of seaweed aquaculture removes nutrients equivalent to the nitrogen inputs to 17.8 ha and phosphorus inputs to 126.7 ha of Chinese coastal waters (Xiao et al., 2017). Chinese seaweed aquaculture annually removes approximately 75,000 t nitrogen and 9,500 t phosphorus, and at current growth rate of seaweed aquaculture, this industry will remove 100% of the current phosphorus inputs to Chinese coastal waters by 2026 (Xiao et al., 2017). Seaweed farms bring about multiple additional environmental benefits, including climate change mitigation (Duarte et al., 2017), along with economic benefits. Yet, their effective role in alleviating eutrophication has not been sufficiently acknowledged, nor generated compensation to the farmers (Xiao et al., 2017). Similarly, harvesting of filter-feeders from established aquaculture farms and reefs contribute to nutrient removal (Lindahl et al., 2005; Petersen et al., 2016). The only full-scale experiment on the use of mussel farms for eutrophication abatement we are aware of was conducted in Skive Fjord (Denmark), where mussel farms were calculated to remove 0.6–0.9 ton N ha−1 year−1 and 0.03–0.05 t P ha−1 year−1 (Petersen et al., 2016). Harvesting of natural seaweed and bivalve populations would also remove nutrients but may involve damage on seagrass beds and benthic processes (e.g., Erftemeijer and Lewis, 2006) and may also damage the ecosystem services of natural macroalgal communities e.g., as a habitat for fish (e.g., Teagle et al., 2017). Harvesting of natural populations should, therefore, either be avoided or carefully regulated to remain sustainable. Indeed policies, such as blue carbon strategies (Duarte et al., 2013), to protect and restore benthic habitats are an important lever to maximize the benefits of ecosystem engineering on overall ecosystem status. Likewise, whereas fisheries can remove nutrients from marine ecosystems, doing so sustainably is a challenge, as most fish stocks are already overexploited. Moreover, fisheries can also impact of food-web structure and disrupt nutrient cycling, therefore rendering coastal ecosystems less efficient in processing nutrients (Cloern, 2001; Pérez-Ruzafa et al., 2011). Indeed, observations and experiences from freshwater ecosystems show that addition of piscivorous fish or depletion of herbivorous fishsuffice to cause a regime shift arresting ecosystems in eutrophied states (Smith and Schindler, 2009). Our understanding of these responses is, however, insufficient at this stage to propose them as an intervention to accelerate recovery from coastal eutrophication. Similarly, the use of seaweed aquaculture to remove nutrients needs to adopt best practices to remove potential negative-side effects, such as oxygen depletion from organic inputs to the sediments, the introduction of exotic species (Naylor et al., 2001), or seeding green tides (Liu et al., 2009, 2010). Coastal ecosystems also support important processes leading to nutrient sequestration in sediments and biomass, which may help remove nutrients and assist in the oligotrophication process (Figure 1). Indeed, internal loading from nutrients recycled from sediments, particularly important in anoxic bottom layers (Vahtera et al., 2007), is a major buffer arresting coastal ecosystems in eutrophic states despite reduced nutrient inputs, as documented for some Baltic areas (e.g., Pitkänen et al., 2001). Interventions to enhance nutrient sequestration may involve efforts to establish, protect and restore ecosystem components with a demonstrated capacity to support high nutrient burial rates (Figure 1). These include seagrass meadows (e.g., Gacia et al., 2002; Kennedy et al., 2010; Fourqurean et al., 2012), oyster reefs (e.g., Newell, 2004; Pollack et al., 2013; Kellogg et al., 2014), mangroves and salt-marshes (e.g., White and Howes, 1994; Valiela and Cole, 2002; Sanders et al., 2016), which remove nutrients from the water column and accumulate part of these nutrients in the sediments. Conserving and assisting the recovery of seagrass, oyster reefs, mangroves and salt-marshes through restoration do not only contribute to enhance nutrient burial, but provide, in parallel, benefits from the multiple ecosystem services these habitats provide. In addition, these habitats also lock nutrients into their biomass, but this only contributes to mitigate eutrophication in as long this is maintained, enhanced or, in the case of oysters, harvested, and also involves a strong seasonal component with maximum nutrient retention in the growth season of the organisms. Intervention options also include geoengineering efforts to lock nutrients, particularly phosphorus, in the sediments (Figure 1). For instance, a recent successful experiment injected dissolved polyaluminum chloride into sediments at 6 m depth in Björnöfjärden in the Baltic Sea to bind phosphorus and prevent its recycling, responsible for sustained cyanobacterial blooms in this area (Rydin et al., 2017). Aluminum injections were highly successful, achieving a remarkable reduction in dissolved inorganic phosphorus concentration, reduced chlorophyll a concentration, and enhanced submarine light penetration allowing deeper submerged aquatic vegetation penetration and much increased abundance of benthic fauna (Rydin et al., 2017). However, such interventions need be considered with care, as aluminum hydroxide has very low solubility at circumneutral pH, but dissolves at alkaline and acid pH, and might then be toxic to aquatic organisms. Additional options to remove phosphorus may include iron injection. Conversion of reactive forms of nitrogen to N2 gas is a major component of the natural nitrogen cycle, removing about 50%, or 24 Tg N yr−1, of the reactive nitrogen entering estuaries and coastal ecosystems (Galloway et al., 2004). This pathway is achieved through denitrification and anammox, processes that operate in hypoxic to anoxic environments (Canfield et al., 2010). Recent results have pointed at the same ecosystem components mediating high nutrient burial rates in coastal ecosystems, seagrass meadows, oyster reefs, mangrove and salt-marshes (e.g., Valiela and Cole, 2002; Sousa et al., 2012), as important vaults for removal of reactive nitrogen as N2 gas emitted to the atmosphere. Denitrification rates in seagrass meadows are reported to be about fivefold greater than those in unvegetated sediments (Reynolds et al., 2016; Eyre et al., 2016; Zarnoch et al., 2017), while oyster reefs also support much higher denitrification rates than adjacent sediments free of such components (Kellogg et al., 2014; Caffrey et al., 2016; Smyth et al., 2016). Anammox rates in seagrass meadows remain poorly studied, but the only report available points at very high rates, albeit lower than denitrification rates (Salk et al., 2017). In oyster reefs, however, anammox rates have not yet been reported, to the best of our knowledge. Mangroves (Cao et al., 2017; Reis et al., 2017) and salt-marshes (Sousa et al., 2012) have also been reported to support very high anammox and denitrification rates, particularly when receiving high nitrate inputs (Koop-Jakobsen and Giblin, 2010; Reis et al., 2017). Hence, a high capacity for removal of reactive nitrogen, through both burial and, particularly, removal of reactive nitrogen as N2 gas, is a key, but hitherto insufficiently realized ecosystem service of seagrass meadows (Reynolds et al., 2016; Zarnoch et al., 2017), oyster reefs (Cerco and Noel, 2007; Kellogg et al., 2014; Caffrey et al., 2016; Smyth et al., 2016), mangroves (Valiela and Cole, 2002; Cao et al., 2017; Reis et al., 2017) and salt-marshes (Valiela and Cole, 2002; Koop-Jakobsen and Giblin, 2010; Sousa et al., 2012). The loss of seagrass meadows with eutrophication (Duarte, 1995), the major loss factor for seagrass meadows globally (Orth et al., 2006), thus, shifts key functional processes that lead to feed-back mechanisms preventing seagrass from re-establishing (Duarte, 1995; Maxwell et al., 2017; Moksnes et al., 2018). 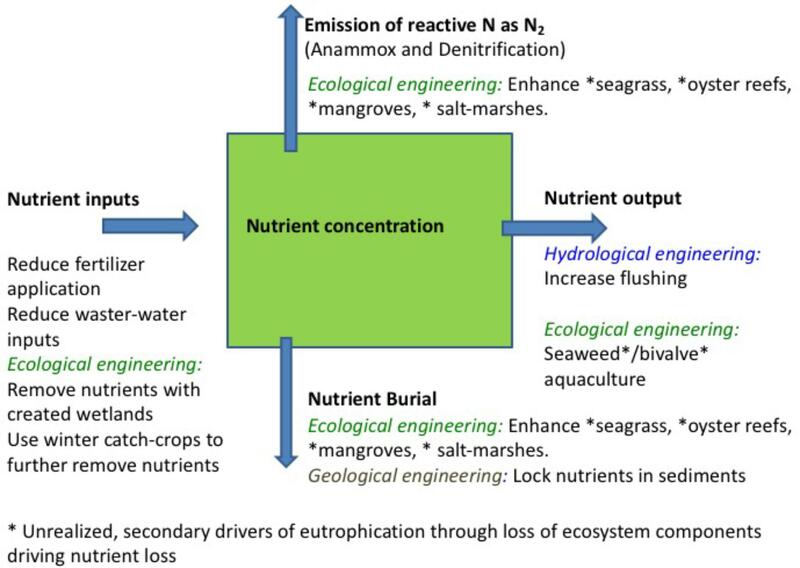 However, most importantly in this context, the loss of seagrass with coastal eutrophication leads to the loss of a major pathway for nitrogen removal from the ecosystem and helps explain the difficulties to revert eutrophication by only reducing nutrient inputs. Seagrass and oyster reef restoration, are well-established ecoengineering solutions that can, therefore, help remove nitrogen and, hence, accelerate oligotrophication. For instance, Reynolds et al. (2016) demonstrated how Zostera marina restoration by seed broadcasting in coastal waters of Virginia, by seed broadcasting, led to accelerated rates of nitrogen loss compared to those expected under unassisted recolonization. Efforts to reduce nutrient inputs to eutrophied coastal ecosystems are starting to show clear signs of recovery three decades after these efforts were initiated. However, additional pressures from growing anthropogenic climate change, including warming, elevated CO2, increased precipitation and oxygen loss, and alterations to food-web or ecosystem structure risk jeopardizing these efforts and arrest coastal ecosystems in eutrophied states. There is, therefore, a need to accelerate efforts to achieve the desired oligotrophication of coastal ecosystems to further assist the very significant scientific, monetary and political capitals already allocated to revert eutrophication. Efforts to accelerate oligotrophication requires a more comprehensive strategy to reduce nutrients in coastal waters than the simple approach taken to date, consisting in reducing nutrient inputs alone. As nutrient reduction efforts continue, the low-hanging fruits to meet this goal, involving addressing point source emissions, are already largely addressed and reducing diffuse sources, particularly atmospheric inputs, remain challenging and expensive, but can be achieved. For instance, reduction of NOx emissions in compliance with the Clean Air Act Amendment of the United States has been shown to be a main driver of nitrogen inputs to Chesapeake Bay (Eshleman and Sabo, 2016). Indeed, reducing fertilizer application and NOx emissions to the atmosphere brings about additional benefits in terms of air quality and reduction of greenhouse gasses, which need be considered in assessment of cost-effectiveness of this measures (Birch et al., 2011). The same is true for the enhancement of vegetated habitats, which not solely serves in eutrophication mitigation but also brings co-benefits e.g., in terms of climate change mitigation and adaptation in addition to providing several other ecosystem services (Duarte et al., 2013). Adopting a nutrient mass balance approach to consider the regulation of coastal nutrient budgets further confirms that nutrient inputs are not the sole lever upon which interventions to revert eutrophication can act (Figure 1). Intervention options also include 1) hydrological engineering to increase nutrient export through enhanced flushing and dilution, 2) ecological engineering in terms of restoration of seagrass meadows and oyster reefs, which sequester nutrients and accelerate the loss of reactive nitrogen as N2 gas and in terms of nutrient removal with seaweed and filter-feeder aquaculture, and 3) geological engineering to enhance nutrient burial through interventions to lock phosphorus in sediments. While efforts to reduce excess nutrient inputs to coastal waters are essential and must continue, their effectiveness will be enhanced by considering additional intervention options. Cost-benefit analyses to consider the most effective combination of intervention options must also consider the additional benefits derived from some of these options. In particular, interventions creating habitats, such as seagrass and oyster reefs and seaweed farms, bring about multiple benefits that can greatly enhance the returns on investment of eutrophication abatement programs. Both authors conceived the research and wrote the paper. This study was supported by the protectMinistry of Environment and Food of Denmark (contract 33010-NIFA-16651) and by the Danish Centre for Environment and Energy (DCE). Boesch, D. F. (2018). The global experience in abating coastal eutrophication: barriers and bridges. Front. Mar. Sci. Duarte, C. M., Losada, I. J., Hendriks, I. E., Mazarrasa, I., and Marbà, N. (2013). The role of coastal plant communities for climate change mitigation and adaptation. Nat. Clim. Change 3, 961–968. Kennedy, H., Beggins, J., Duarte, C. M., Fourqurean, J. W., Holmer, M., Marbà, N., et al. (2010). Seagrass sediments as a global carbon sink: isotopic constraints. Global Biogeochem. Cycles 24:GB4026. doi: 10.1029/2010GB003848. Newell, R. I. (2004). Ecosystem influences of natural and cultivated populations of suspension-feeding bivalve molluscs: a review. J. Shellfish Res. 23, 51–62. Teagle, H., Hawkins, S. J., Moore, P. J., and Smale, D. A. (2017). The role of kelp species as biogenic habitat formers in coastal marine ecosystems. J. Exp. Mar. Biol. Ecol. 492, 81–98. Vollenweider, R. A. (1970). Scientific Fundamentals of the Eutrophication of Lakes and Flowing Waters, With Particular Reference to Nitrogen and Phosphorus as Factors in Eutrophication. Paris: OECD. Copyright © 2018 Duarte and Krause-Jensen. This is an open-access article distributed under the terms of the Creative Commons Attribution License (CC BY). The use, distribution or reproduction in other forums is permitted, provided the original author(s) and the copyright owner(s) are credited and that the original publication in this journal is cited, in accordance with accepted academic practice. No use, distribution or reproduction is permitted which does not comply with these terms.